This is an idea that I tried years ago as a My Obstacle Course station activity when working on ball skills but heard about it again last week from Andrew’s Occupational Therapist so I thought I would share. I began using balloons when it became obvious to me that ball skills were going to be difficult for him. I knew that a balloon would move much slower than a ball giving him more time to track and catch it. I could also have a few blown up, giving him an opportunity to choose the color he wanted to play with. His therapist is using this with him now because they are working on making and keeping eye contact as well as tracking an object as it is passed between him and other therapists and children. He has to watch her eyes to see when and where the balloon is going to go. Clever and fun! 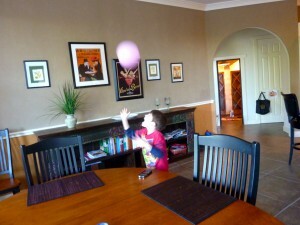 Here are some pictures of him tossing and catching the balloon at home. He had spontaneously come up with a game of it being a pink fly that was flying around the room. For us this is huge because he had major bug anxiety last summer and even a little bit of pretend play involving an insect is a big deal! 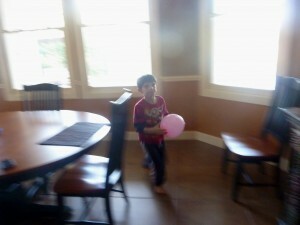 He tossed the balloon up and ran around trying to catch it before it landed on the ground. So fun to finally see some of this sort of play! I love how big his mouth is while catching this! 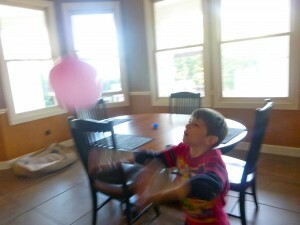 A colorful balloon is the perfect tool for this because it is bright and moves slower, giving more time to react. Balloons are inexpensive yet always tend to make something more fun and festive, which is another reason it is a great add-in for a My Obstacle Course.